"This electromechanical counting machine was designed to eliminate variables at high speed. Its action was described as 'machines that go on ticking until they reach a combination that will cause them to produce an output'; hence bombe." Photo: Refurbished Huts 11 and 10 © LSA August 2015. The seemingly ramshackle huts were heavily strengthened with reinforced concrete and supported by RSJs (Rolled Steel Joists) to protect them against possible air strikes. Such was the importance of the work taking place within. A Bombe Machine was quite a bulky beast and could only just fit through the comparatively narrow doorway. The Bombes were about 6 feet high by 6 feet wide, rather like a large wardrobe, save for the masses of spindles, shafts, wheels, brushes and commutators within them. With all those whirring spindles, the Bombes were very noisy and generated a lot of heat. 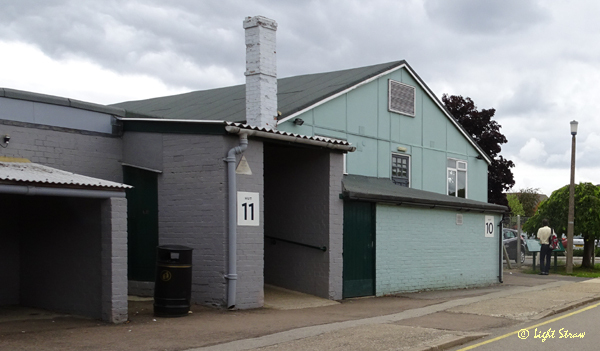 In the early days of The Trust, Hut 11A was requiring attention. 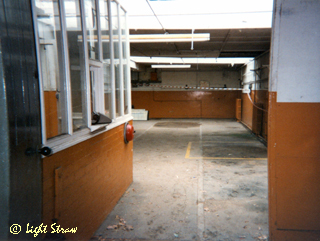 Photo: Hut 11A showing the puddles from the leaking roof © LSA October 1994. 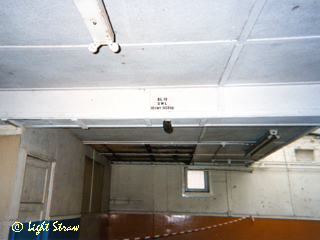 Photo: The RSJ across the roof confirms the heavily reinforced structure © LSA October 1994. 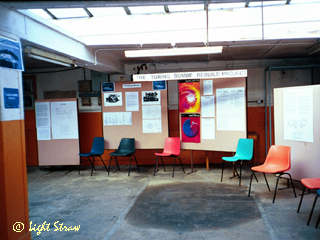 By October 1999 the 'Turing Bombe Rebuild Project' was well underway with several important sponsors and a enough volunteers to have built the basic framework for a single Bombe. 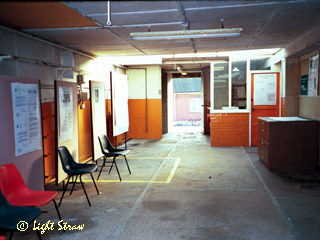 Photo: Early days of the Bombe Rebuild in Hut 11A © LSA October 1999. Here is a 'mock-up' in wood of a real 'Bombe' as seen in the TV series 'Station X.' The wheels are marked with the alphabet A-Z in varying combinations, just like in the real machines. To the far left of the photo can be seen the metal framework and castor wheels of the replica which was being built. 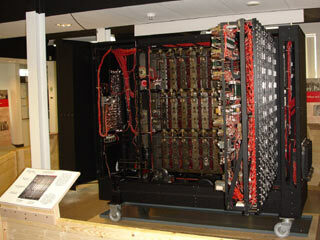 See the Turing Bombe Rebuild. 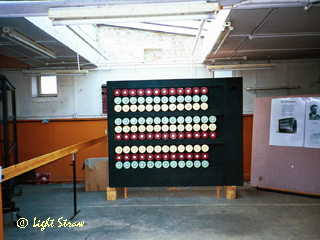 Photo: The Bombe Rebuild in B Block Â© LSA July 2007. Design, images and text compiled by © Light-Straw. Page last updated Jan 2019.